An integrated public realm destination with distinct conservation values, Baringa Town Square showcases Stockland’s urban promise of a green, distinctive, healthy and happy place that engages the entire community through inclusive human-centric design. The Baringa Town Square is a key community destination in the first stage of Stockland’s future city of 50,000 people. As the centre of activity for the initial development stage, the Town Square provides a glimpse in to the future of Aura, showcasing the ‘urban promise’ of a green, talented, distinctive, happy and healthy place. Place Design Group worked closely with landscape contractor Eureka Landscapes to create a vibrant community hub featuring an urban youth skate plaza, feasting tables with BBQ facilities, seating pods with acoustic speaker boxes, a bespoke climbable Baringa sign sculpture, charging stations, a ceremony space and a celebration lawn for over 1000 people. 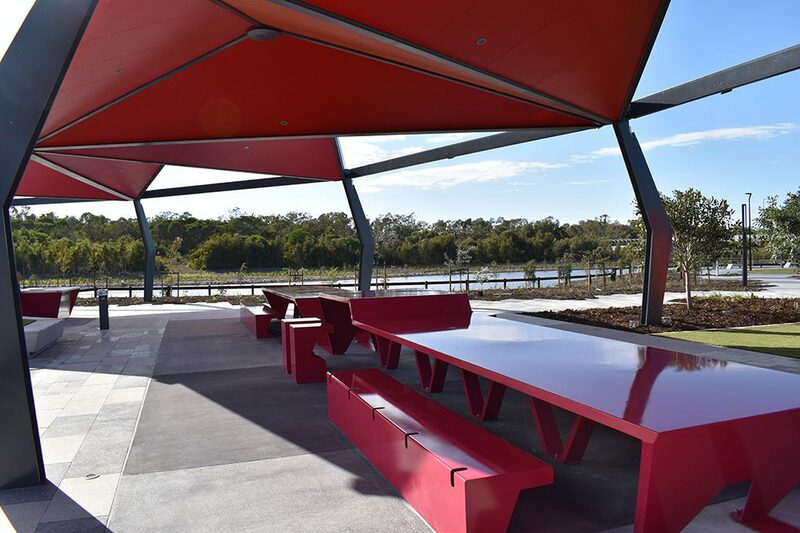 Adjacent to a 700-hectare conservation reserve, the design focused on allowing the environment to flow into the space, achieved through soft feathered edging and a boardwalk viewing platform promote the area’s melaleuca character. The Town Square will be the first public space on the Sunshine Coast to incorporate skateable public infrastructure, as part of a focus on integrating youth activities within the district centre surrounds to be built over the next five years.